Bovada Casino opened its doors in 2011 as the re-branded Bodog Casino for USA players, which speaks volumes about its legitimacy and popularity. Players from all over the United States can play at this casino and enjoy the great variety of real money online casino games in a totally safe and satisfying gaming experience. This casino is unique in being US-only – international players cannot register or play here. Bovada.lv offers all of their U.S. players the option to download and install their casino software. The alternative is to play the casino games via the instant play version of their software, which works in your browser. You can access the slots here via your iPhone, Android or Windows Mobile device. The software at this site is powered by the popular Realtime Gaming, with a great selection of BetSoft slots too. Once you’ve created a player account, you’ll be able to access their main site as well as login to their mobile casino – this is a 2 minute process and will allow you to explore the games before you play for real money. They also have progressive slots giving players the chance to win huge jackpots. You can play all the popular RTG Real Series slots like Aladdin’s Wishes, Caesar’s Empire, and Cleopatra’s Gold Slots, just to name a few. A random jackpot is paid out in these games regardless of the amount wagered per spin. If you’re looking to play table games, Bovada Casino is your place as it has unique collection of table games, including Blackjack, Roulette, Craps, Caribbean stud and Baccarat. Bovada casino’s mobile app supports a wide range of mobile devices including the iPad, iPhone, and Android smartphones and tablets. This means that players can play all of their favourite online casino games offered by Bovada.lv on their mobile. 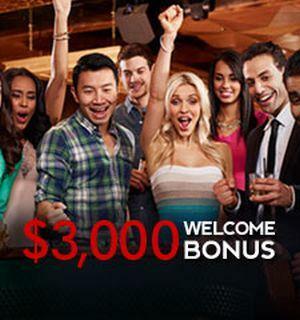 Bovada is one of those few US-friendly casinos that offer an excellent welcome bonus. The casino provides an outstanding welcome bonus package for new players, and it doesn’t just apply to first time deposits but on up to the first eight deposits for playing online slots and other casino games. 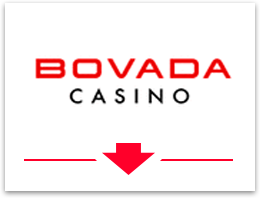 The generous 100% match bonus (up to $3,000) offered by Bovada is made up of eight 100% match bonuses - four of which apply to playing slot machines, and four 100% match bonuses can be used for playing specialty games and the different variations of video poker. Players are first required to wager 50 times their bonus plus the deposit to be allowed to withdraw any associated winnings for slots play. The play through requirements for table games is 80 times the bonus and deposit amount, both of these are high compared to other casinos. Bovada casino is the best US choice in terms of player promotions. They are always offering plenty of regular promotional offers to keep their casino players happy. On Tuesdays, players that make their way over to the table games and wager at least $250 will be eligible to receive a $10 casino chip. Wednesday is the day for video poker lovers with players offered the opportunity to earn a $52 cash bonus plus earn a share of $5,200 in weekly prizes. However, if playing on the weekend suits you more, then you’ll be able to hit up the Blackjack tables Friday through to Sunday. For every 200 Casino Points a player earns in Blackjack games they will receive a $10 casino chip up to the maximum of $100. Besides the superb welcome bonus and the ongoing promotions, eligible players at Bovada Casino are rewarded with weekly casino rewards every Monday and Thursday which are paid directly to your casino account and have no rollover. The casino is also well-known for providing seasonal promotions which tend to be offered during larger sporting events such as the Olympics, Winter Olympics, and the Super Bowl. Bovada.lv offers literally 24/7 customer support. You can reach the customer support team by telephone or e-mail and you can expect a response to any questions within a few hours. Bovada Casino is well recognized for providing excellent customer support to its players. Depositing into Baeda’s casino is hassle-free you can fund your casino account using any convenient payment method, including credit cards such as Visa / MasterCard / Amex, you can also buy a pre-paid Visa or try a money transfer system, for example Western Union. Even though the majority of US online casinos process withdrawals with a check at Bovada they also allow their players to cash out using money transfer services like Western Union and Rapid Transfer from MoneyGram. These withdrawal methods are available when you’ve used them to deposit funds into your account. At the time of writing this Bovada Casino review, check withdrawals are taking around 7 days and money transfer withdrawals are taking 1-2 days on average. Both of these are very fast when you compare them to time cash out times of other US casinos. Bovada is clearly the strongest online casino sites accepting American players. You should make your way over to the Bovada casino tables to find out what all the hype is about! The great thing about playing at this online casino is that players can use the same account to check out the attached poker room at Bovada to play Texas Holdem and Omaha tournaments and cash games. You can also venture over to Baeda’s sportsbook and racebook so you can bet on all your favourite sports with pre-game, in-play, and mobile betting options. Check out www.bovada.lv for yourself now.